The 2019 festival takes place from February 10th to 17th. Stroll through the tents setup in Holetown at the festival village, where talented local artists showcase and sell their creations, including pottery, fine art, soaps and candles, straw works, metal sculptures, clothing and bags! And of course sample delicious Bajan food (fish cakes, macaroni pie, barbecue chicken, pudding & souse), washed down with a cold Banks Beer or a shot of Barbados rum! 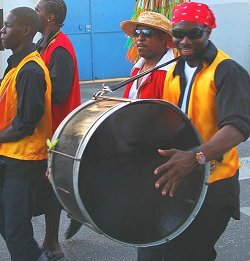 One of the most popular events at the Holetown Festival is the Police Tattoo, an outdoor night show featuring the men and women of the Royal Barbados Police Force. The police force band, mounted troop, canine unit and motorcycle unit are usually on display.